Posted on April 24, 2013 by Susan H.
In 1998, my eldest son, Michael was 2 years old…suffering from severe eczema, multiple food allergies, sensitivities and asthma. At the end of the year, I gave birth to my second son, Matthew…only to discover, years later, he also had food allergies, eczema and asthma. Who knew, that same year, 18 year old twin brothers, Evan and Eric Edwards, (allergies include peanut/tree nuts, shellfish, fish and antibiotics), had sketched on a napkin...a design for an auto-injector that would fit inside their blue jeans pocket. An activity that ultimately…determined the brothers’ educational paths (pharmaceutical science/medicine and engineering)…career paths (founded a specialty pharmaceutical company named Intelliject)…business decision (Sanofi bought the North American licensing rights to the new auto-injector)…and created, some 15 years later, the first voice-prompted auto-injector…Allerject. Click here for a link to their site. Take note of their offer for a free Allerject trainer and Allerject carrying case per household. I received my copy (December 2012) just days before heading out for the boys’ annual allergy testing at the allergist…I brought it along. 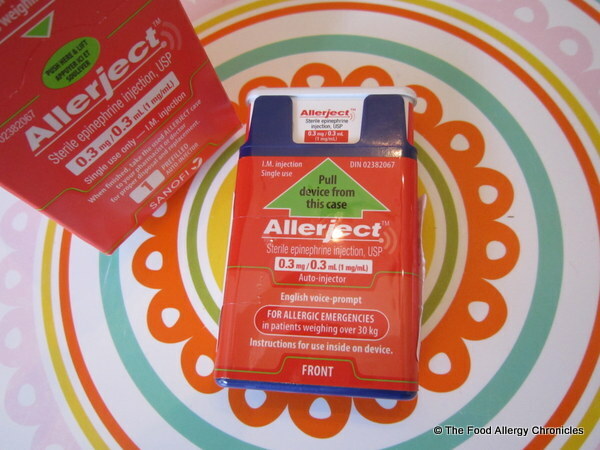 My allergist was surprised to see that Allerject was almost ready to ‘hit the shelves’…at this point, Allerject was awaiting approval from Health Canada…hopefully becoming available in early 2013. The allergist wrote a prescription for both the boys for Epi Pens and Allerjects…thus becoming the allergist’s very first written prescription for Allerject. As the boys’ Epi Pens expired this month…I was eager to get to the pharmacy to fill their prescriptions for Allerject. I was pleased to discover…not only was Allerject available but the pharmacy had an Allerject trainer. I have to say…I think the pharmacist and her assistant were just as eager to try out the Allerject trainer as I was…it was very cool. Surprising my boys with the Edward twins ‘dream come true’…their very own Allerject…priceless! 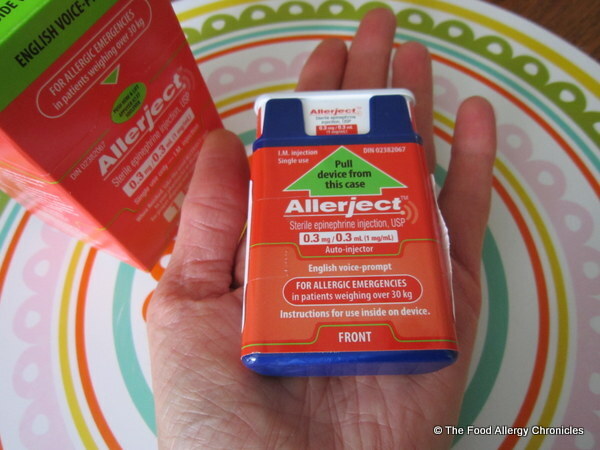 Allerject fits in the palm of your hand. Michael just loves it…perfect for a teen that is uncomfortable carrying around a bulky auto-injector. Allerject has fit into his life at an ideal time. Thank you for dreaming big…thank you for following your dream…thank you for proving that taking what you know (I need to carry an auto-injector because I have anaphylaxis) to solve that which you don’t know (how can I improve this auto-injector so it is easy to carry around, easy to use and teen friendly) is do-able…that dreams really can come true no matter how big. P.S. I have just received my free Allerject trainer to practice with my boys, family members, friends and staff at my boys’ high school. Yippee! 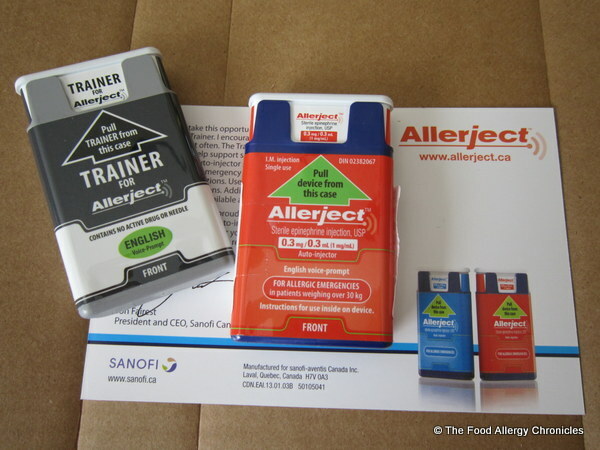 The Allerject trainer is well marked and a totally different colour than the actual Allerject. I will be heading to the high-school today with a letter outlining the boys’ new auto-injector…Allerject. I will be speaking to the Vice-Principal to discuss the best method of training for the administration of the Allerject to the boys’ immediate teachers and overall high-school staff. I hope they are excited about this opportunity as I am! P.P.S. The United States equivalent to the Allerject is called the Auvi-Q. Click here for a link to their site. Will you be choosing the Allerject/Auvi-Q for your next auto-injector for yourself or your child? How will the Allerject/Auvi-Q make a difference in your life? If you have one already…what do you think? This entry was posted in allergies, Allerject, coping with multiple food allergies, multiple food allergies and tagged allergic living magazine, Allerject, Allerject trainer, Auvi-Q, Evan and Eric Edwards, Intelliject, Sanofi by Susan H.. Bookmark the permalink. How fabulous! I have goosebumps and I am so excited. I would love the training so I can spread the word at my work. How lucky we all are to have you keeping abreast of all the new advances and sharing the knowledge with us. Thank you! What a great and much needed new product! I just refilled my Epi-pen and for now i’m ‘good’. I think it’s different if you’re a kid or a man… women and most girls carry a purse of some type, but men on the other hand don’t really have anything but a “pocket”, so something like this is awesome!! So glad you got yours for your boys! Hope to get myself one this week! It’s so tiny and convenient for teens!!! Yes I received my trainer about a month ago and love it! So tiny! As mom to a 13 yr old boy, I am thrilled about this! I anxiously and excitedly read the article when it made it in the US edition of Allergic Living. We are going to the allergist in May and will request a prescription. My plan is to keep Epi-pens for the school since he only has one year left there and then probably move 100% to these for high school because he will carry it full time by that time. Thanks for all the info. you have provided! WOW – very cool!!! What a story! Thanks! Do you think you will switch over to the Allerject? I’m actually not anaphylactic! The only time it gets hard to breathe is when I drink champagne – I’m allergic to the benzoic acid. My throat hasn’t closed up from it, though. I consider myself very lucky and hope my reactions never go that far! I must say, the Allerject will be perfect for my little wrist purses. 🙂 Will you be switching over to the Allerject? I have the Allerject as well ( although in the US where I live, it’s called Auvi-Q) for my allergies to peanuts, all tree nuts and shellfish. Like you said, it’s a lot easier for a teenager or anyone to carry their medicine with them. When I was in high school, carrying my Epipens would be a pain since they were so big. It didn’t even fit in my purse for prom! Thank god some created a smaller epinephrine device! Yes, the Allerject definitely is easier to ‘pocket’ for guys and fits into girls’ ‘hip’ little purses without taking up too much room. I know this, as I often carry the back-up Allerjects.